For 24-hour emergency assistance with a sanitary sewer flood in your home, call Utilities Kingston at 613-546-1181. We will check the sanitary sewer collection system, ensure it’s working properly, and correct any issues we may find. Homeowners own the sewer pipe from the home’s plumbing system to the property line. If the problem is with this, or other components of your home's plumbing, you will need to contact a licensed plumber. If your basement has flooded, there are some really important safety considerations you should know. When in doubt, don’t enter the flooded area until you are told it is safe by a professional qualified to do so. Flooding of a basement is never a pleasant experience. If you have a home with a basement, flooding is an inherent risk simply due to the nature of what it is – a space built into the ground. Not only is your basement at risk of potential flooding from surface water, storm water, and groundwater, but it is also at risk of a sewage backup. While the risk from day to day is quite low, the chance does exist, particularly during a severe rain event, and the best way to reduce that risk is to understand the causes of basement flooding, and know how to best protect your investment. We have prepared a series of web pages filled with useful information and links to other great resources on the topic of basement flooding. To learn more, start with our Basement Flooding Awareness page. Know the risk of cross bores before you attempt to clear it. 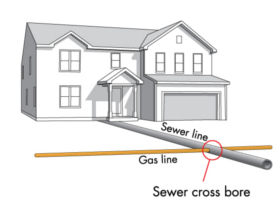 Natural gas lines can sometimes intersect with sewer lines beyond the outside wall of your home or building. In these cases, clearing a blocked sewer line with motorized or water jetting equipment could damage the natural gas line and lead to a gas leak, creating an immediate safety risk for you and others. When left undisturbed, cross bores do not pose a safety hazard to anyone. Before clearing a blocked sewer line, call Ontario One Call at 1-800-400-2255 to schedule a free sewer safety inspection. Get additional flood safety information from the Electrical Safety Authority.